Gorgeous acoustic sound, and looks to match. 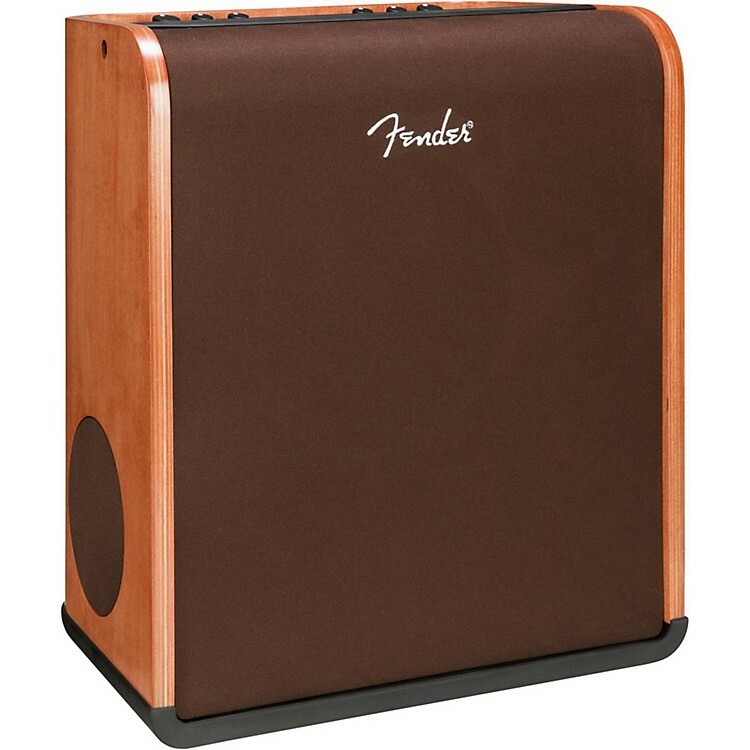 The Fender Acoustic SFX amplifier gives acoustic players full, natural tone and stunning Stereo Field Expansion technology (SFX), which goes beyond stereo for room-filling tonal imagery that envelops the listener in a rich acoustic experience. Its gracefully curved, acoustically designed wood shell complements an acoustic guitar's form and speaks to the aesthetic sensibilities of the acoustic musician. And the rubbed cinnamon finish adds even more stage presence to complement the sound. The perfect portable system for solo performances in a variety of venues, the Acoustic SFX has two universal channels designed for instrument or microphone use, each with its own selection of studio-quality effects. Exciting multi-dimensional SFX sound reproduction brings effects such as hall reverb, echo, delay and Vibratone to even more dynamic life by literally moving them around the listening area, be it a coffeehouse, pub or living room. Other convenient player features include an integrated handle that also holds personal mobile devices for playback of recorded material, and a fitted cover. For the discerning player in search of an eye-catching piece of acoustic architecture, the Acoustic SFX offers state-of-the-art technology for a lush sonic experience unlike any other. The ultimate solution for acoustic players, the lightweight design and portability suit anyone looking for a grab-and-go rig for small venues, offering a pleasing sound image to people located all throughout the room. Acoustic SFX has two universal channels designed for use with guitars or microphones, each with its own 1/4"-XLR combo jack and spectacular studio-quality effects. The multi-dimensional, stunning Stereo Field Expansion technology (SFX) goes beyond stereo for room-filling tonal imagery that envelops the listener in a rich acoustic experience. The amp imparts exciting, dynamic life to the onboard hall reverb, echo, delay and Vibratone effects literally moving them around the listening area for amazingly deep tone. The integrated handle doubles as convenient cradle for mobile playback devices”perfect for adding accompaniment to your performance via the Aux In jack. Other performance-friendly features include feedback-reducing phase switches, line output, fitted cover and a footswitch jack for the optional two- button effect bypass footswitch. From first glance, the Acoustic SFX amplifier is the essence of form and function. The cabinet has been dutifully constructed not only for stunning good looks, but also for enhanced resonance and projection. As sleek as it is practical, the smooth wooden shell and bent plywood construction are the perfect combination of high-grade materials and sleek, modern curvature, designed to enhance the outward projection of your guitar tone. Coalescing with these distinguished cosmetic touches are an elegant grille cloth and expanded control panel, making the Acoustic SFX the perfect specimen in tonal flexibility and sophistication.